The children and I have just received our ’30 Days Wild pack’ and are all very excited to spend a month with nature. We live in a densely populated Welsh Valley town surrounded by beautiful rugged terrain with all sorts of diverse and wonderful wildlife. It is often said that “Life is like riding a Bicycle”…..all you need is; a bit of balance, keep yourself strong and healthy to get up those tough valley climbs and be prepared for the dangers ahead. Keep on peddling and you will get to the finish line and all will be fine! But sadly life is not all that simple, the road often gets bumpy and you can lose your balance and fall off, or the hill is too steep and you have to give up, or at the slightest distraction the dangers ahead pop up before you notice them and CRASH you are out of the race. We have all fallen off at some point and have suffered life’s cuts and bruises as a result. The truth is, by our very nature we cannot cross that finish line in our own strength, the course of life is too difficult, none of us are perfect. Even the greatest men of the Bible fell off their “bikes” at some point. Adam disobeyed God, Noah a drunkard, Abraham lied, Moses a murderer, Gideon an idolater, David an adulterer, Peter denied Christ three times and Paul persecuted the church. Yet the Bible tells us that they all got to the finish line! Not by their own strength and ability but by trusting in their Saviour, Jesus Christ the Son of God, who by His Grace lifted them up when they fell, washed away their dirt and guided them safely through to the finish line. The church at Noddfa does not claim to be a home for the yellow jackets, although those who know Christ have been given His. Noddfa is a place for those of us with scruffy knees, bent frames, flat tires and sore limbs who keep falling off and are looking for help. Noddfa is also home for those who think they are doing fine, peddling in their own strength, but are simply lost and seeking a purpose and direction in life. If you want to find out more about Jesus Christ and how He can help you get you through life’s Velothon, why not come and join us at Noddfa? Because of the road closures for the Velothon we have a shared service at High Street Baptist Church (Abersychan) 11am. If you can’t usually make Sunday mornings but are now stuck at home with nothing to do it is a great time to come and have a taster of church! Come as you are, all are welcome! We look forward to welcoming the Welsh Velothon back to our village (Aberyshcan) despite the seeming inconvenience of having many of our congregation out, because the race that has divided our county has brought two churches closer together . Let me start by stating clearly that I follow King Jesus. I am not a proponent of “church and state,” neither is the below piece intended to show any favouritism or indeed affiliation toward any political party. With that now said… let us begin! It was over a year ago now that I was asked by Councillor Giles Davies to join Rev. Martin Freeman as his chaplain during his tenure as Mayor of Torfaen. I was flattered and put it to prayer. I agreed and by God’s Grace the year has been a real blessing. Giles has given me the opportunity to meet and engage with people in the community that I might otherwise not have had the chance to. The role began at Giles’ induction (May 2015) where I was brought in before the Council to accept the commission and pray for the new Mayor, a daunting task that ended with a rather serial applause from the council – I get myself into some crazy situations! A few weeks later I received a call from Giles, inviting me to join him at the Blaenavon World Heritage Carnival. This was simply to show support (in his guise as Mayor) and for a walk around the shops for a meet and greet. I dressed accordingly (jeans and a short sleeved shirt). To my surprise, I ended up leading the parade down the high street alongside the Mayor and our MP. As I walked past the many faces in the crowds lining the road I was told to wave and smile, I felt so out of place in my casuals and could not hide my embarrassment, repeating Isaiah 61:10 in my head as I walked. To my horror, later that week, a picture of us all appeared in the Free Press, front page! It was a privilege to be part of such an occasion. Another duty of the Mayor is to go to parliament and it was a pleasure to accompany Giles. I had a great day walking the halls where many a hero such as Oliver Cromwell, Lloyd George, Winston Churchill and Nye Bevan once walked. I was humbled to sit in the viewing area to witness our democracy in action (you can read more about the day here – A day in Parliament). To the “enjoyment” of the Mayor and Mayoress, the car journey to and from London was filled with theological debate with my Methodist brother Rev. Martin Freemen. Together we have judged painting competitions in Pontypool Park, shares a cream tea in the museum, enjoyed garden parties, fireworks at the Golf club where Giles arranged for Folly Tower to be lit Purple (in support of Pancreatic Cancer UK), we have supported and been part of local concerts, memorial services, school plays, fundraisers, memorial services and pub quizzes. I have had a chance to meet and work alongside Churches and Ministers from across the county, something I longed to do. All of this was just the tip of the Iceberg of the Mayor’s role. Between the Ministry and secular employment I simply could not accompany Giles to everything, my entire year’s service could be compressed to just one of his active weeks, he truly embraced his opportunity to be the first among equals of Torfaen. The year has not been easy for Giles. He has been one of the faces of a council faced with great austerity; we have both campaigned vehemently to save our local Victoria Village School and Brynteg Nursery (that has not been easy and put him in an awkward situation at times). Giles has had to balance his work as Councillor for Abersychan as well as Mayor (alongside the “day job”). This left little time for his family, including his wonderful daughter, who has supported him all the way. I am surprised Giles has not burned himself out with the workload and I have prayed that God would uphold him. A prayer answered. Whatever you’re political or personal view of the man, I can say he worked hard for our county and I am pleased to call him friend. Giles brought the office of Mayor into the 21st century, being the first in history to have a twitter account desiring to be both transparent and approachable through all communication channels; he worked with the greatest sincerity aiming to achieve the impossible task of pleasing everybody. Giles took his duty seriously (with his heart on his sleeve) and whilst out on engagement would always seek to support local businesses, purchasing goods (from his own pocket) to buy anything from cheese platter’s to commissioning paintings from local artists. He worked with a humble spirit and saw his position as a privilege and raised thousands of pounds for his chosen charities; Alzheimer’s, Llanerch Disaster Memorial fund, British Heart Foundation and Pancreatic Cancer UK. Giles has regularly supported the outreach at Noddfa, attending special events in a personal capacity and in his guise as Mayor, for that I am grateful. The last function he attended at the church as Mayor was the Queen’s birthday party where he and Gwyneira shared my vision to bring the local churches together and show our unity in Jesus. Giles would be the first to admit that his efforts were could not have been achieved without his team, I did not have the pleasure of meeting them all, but would like to thank them all especially Hywel (chief advisor, security, chauffer, guardian of the chain, comedian and all round legend) and the wonderful and hardworking Chris Slade. Sadly I could not attend the handover as I have just returned home from a family holiday, but delighted to hear that the baton of “Chaplain to the Mayor” has now been past onto another Evangelical Rev Johnny Raine at Pontrhydryrun Church. I will continue to pray for Giles and all the other Councillors, as well as our new Mayoress Veronica Crick, may the Lord bless you in your service. This bank holiday my wife needed some “me time” and went out shopping for a few hours. This left me in an unusual situation of having all four of my darling offspring at the same time! My brain simply can’t cope in this situation, being stuck in the house was simply not an option! So despite the rain we all went outside. 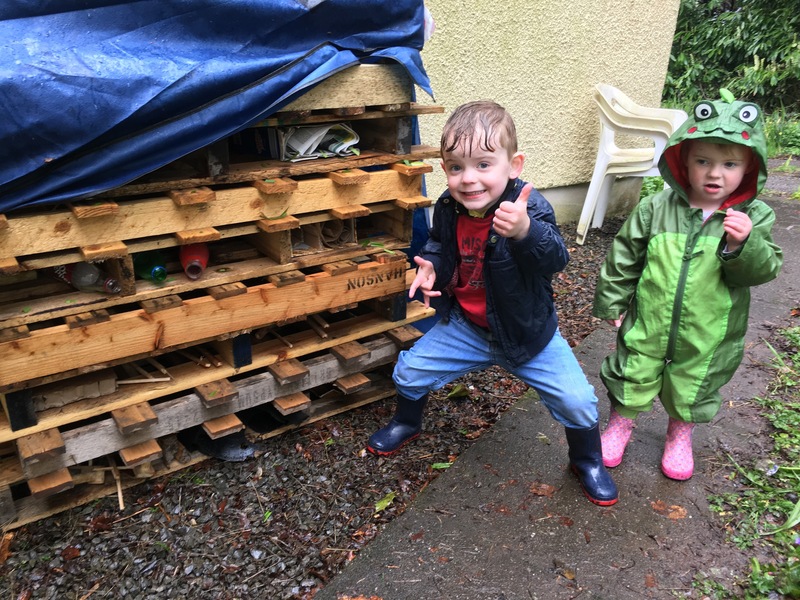 I had some pallets spare that I was saving to build a bug hotel with as one of our activities for ‘30 Days Wild‘. But it was an emergency, I had four children under 9, bored and wet. We went ahead with construction. It is advised that you build a “Bug hotel,” or as Oscar (7) re-named it “Bug Bunk” (proudly stating that this is an alliteration), next to a wild area. This is so the insects would not have far to find it. To have the bug bunk in such a location would have involved me digging up the garden to put some kind of foundation in. So instead we decided to build it behind the garage on a prepared gravel service, the area is sheltered by the house from the elements and catches the morning sun. The bugs will love it! Abigail (2) and I piled up the pallates, Arthur (9) and Sammy (3) went off around the manse and church grounds to collect sticks, stones and broken pottery, Oscar (7) project managed. Once we built the structure, I found an old pirate canopy to cover the roof with, making the hotel waterproof. 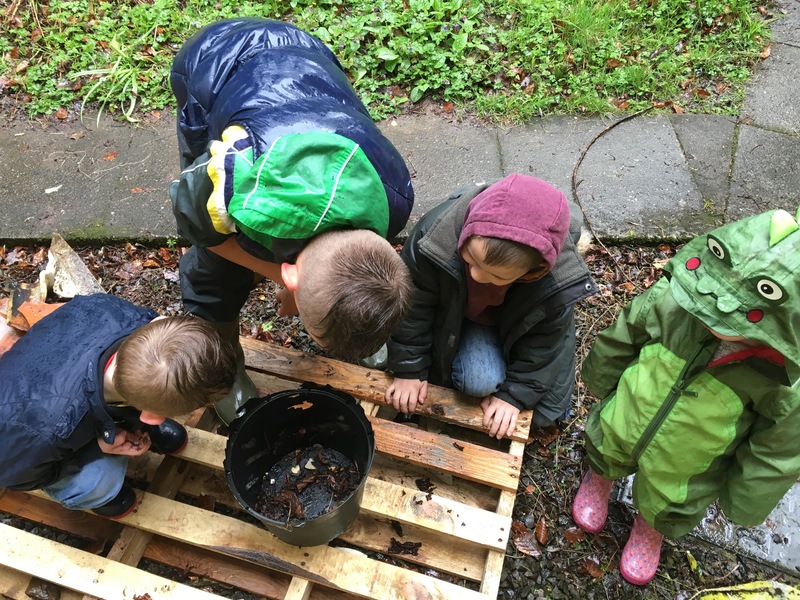 We filled the pallet gaps with the stones (at the bottom)’ and wet leaves hoping to attract the odd toad, dry sticks further up and pottery on the top. We then all went into the garage to make some insect beds. This included cereal boxes containing rolls of cardboard inside, plastic bottles (lids off) filled with shredded newspaper and plastic punnets with dried grass (taken from the hibernating lawn mower). We returned to the ‘bug bunk’ and put all these creature comforts in the centre hoping to attract bees, and maybe some small mammals. 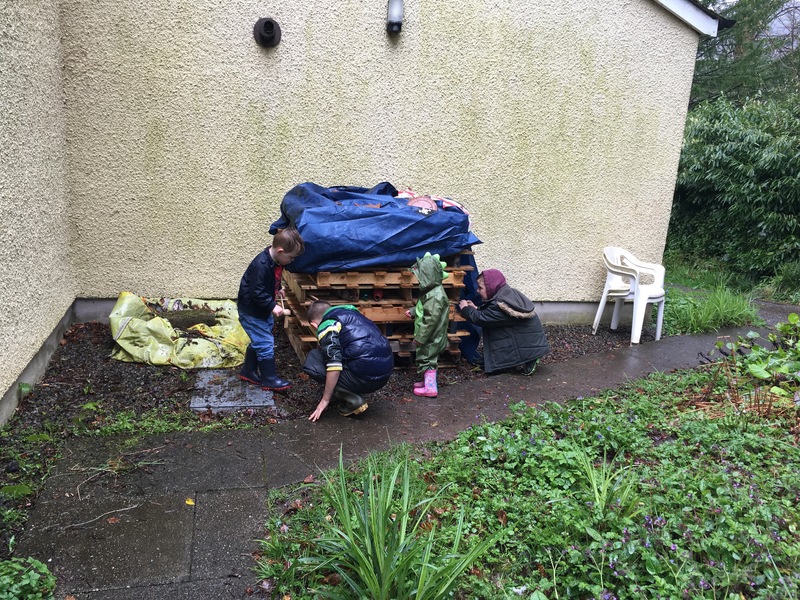 We had some great fun, the kids got wet and muddy (which is what it is all about) and the wife came home overjoyed with the clean up operation. I think I might be spending the night in the bug hotel!